This is the most common reason for case referral in this practice. We field telephone calls on this subject daily. We recently updated our news page article. In the same sentence as being told the dog or cat has a fractured tooth we are often told "and it's not painful". The fact is that it is painful. As painful as it would be if you broke a tooth and exposed the pulp yourself. Animals are conditioned to respond differently, are much more stoic and have no concept that they can be helped. Fractured teeth do not always have to be removed. There is usually an alternative available - see the description of root filling below. For some teeth (lower canines are a good example) it can be far easier and less invasive to root fill them than remove them. When root filled they still provide function and stability to the symphysis. The success of root canal treatment in dogs is quoted as 95% (Kuntsi-Vaattovaara 2002: JAVMA 220, 6). What can fracture a tooth in a dog or cat? The answer is surprisingly small amounts of force. Research from 1998 (Duke A) proved the main cusp of an upper carnassial tooth of a 20kg dog will fracture with 90 Kg of force (KgF). This force is very easy to achieve, particularly when the dog bites an object that has no "give" in it. When the sharp cusp of a tooth comes into contact with a toy it has to be able to enter it by a few millimetres if it is not to break. Normally the teeth will be used to cut flesh into strips they can swallow. Theere are no crushing teeth in the mouth of a dog - hence the problem of providing toys that are hard. Soft toys often don't last very long. Hence the reason owners buy hard toys. If the toy has a degree of longevity it is percieved as "good value for money". It's not if it breaks a tooth! Our advice on toys for dogs is very simple - if you can't pit the surface with a finger nail it's too hard. This means a complete change in the advice vets give owners about what is "good for teeth". Our guide to safe chews can be downloaded here. An interesting public service flier about feeding bones to dogs was posted online by the US Food & Drug Administration. See it here. So what happens in the wild? The very same thing - teeth get broken on bones and when fighting. A broken canine or carnassial for a wild carnivore can be a death sentence. The swelling, pain and infection prevent them catching and eating their prey and, also, defending themselves. Research on African Wild Dogs by South Africa by Steenkamp and wolves in Brazil by Furtado concluded they suffer the same level of dental disease as domestic dogs. The advice for fractured deciduous (baby) teeth can be seen at the bottom of this column. They are often a challenge due to their size. In essence the problem is the same for them. Fractured teeth with pulp exposure can be root filled or extracted – never left to "wait and see what happens". Root canal treatment can save these teeth without the problems encountered with a difficult extraction. It often takes around the same time, or less, to perform a root canal filling than to surgically extract a large tooth like a canines or a carnassial. In zoo or large, wild carnivores this is almost always the treatment of choice. A tooth extraction is a surgically invasive procedure that leaves a large deficit in the jaw. An endodontic treatment (root canal) maintains the function and appearance of the tooth with a much better result for the patient. For canine and carnassial teeth this is very important. Conventional endodontic treatment carries a very good success rate of over 95% in our practice. This page describes the treatment of teeth with complicated crown fractures - when the pulp is exposed, infected, inflamed or necrotic. Blunt trauma to a tooth can kill the pulp without exposing it to the air. Our page on pulp damage/purple teeth describes the action in these circumstances. The tooth below fractured when the dog caught a stone. Within hours the pulp is infected and inflamed creating a classic "toothache" or pulpitis. Our options at this time are to remove the tooth or to remove the pulp - a root canal treatment. The pulp below was so painful the dog would react when it was touched - even under full anaesthesia! We use a variety of techniques to provide the most appropriate treatment for the tooth. This may involve the latest technology in veterinary endodontics. The files used are LightSpeed™ nickel titanium reamers, which are used in an ultra-slow handpiece for internal canal shaping and cleaning. These files clean the internal canals walls predictably and exactly where needed without the problems previous motor driven files experienced with binding and breaking in long root canals. We also use a mixture of cements and gutta percha filling techniques depending on the circumstances. The LightSpeed™ Simplifill plugs used with the LightSpeed™ files and an epoxy resin cement provide a solid and predictable apical fill (very important) every time. Novel gutta percha techniques, such as GuttaFlow, used in conjunction with Simplifill plugs have been proven by independent peer reviewed papers to be the most durable fills in animals. The image below left is an electro-micrograph of bacteria in the pulp chamber and dentine tubules following exposure of pulp by fracture. Below, middle and right are teeth with K-files in the root canals during cleaning. The upper premolar 4 has three roots. Middle - Fractured 108: RU premolar 4. Right - Fractured 404: RL canine. Left: LightSpeed™ file to full working length of 46mm. Right: Final fill with a SimpliFill plug and GuttaFlow backfill. These new technologies (LightSpeed™ files and SimpliFill plugs) make challenging canals much less of a problem. In our experience a mixture of the modern and traditional is often the most efficacious. Not all fractured teeth can be root filled. Any tooth with a long axis fracture below the bone crest is not suited to root canal work. Also any tooth with moderate to severe periodontal disease. We will carefully asses any tooth before treatment and advise before proceeding. We aim to conclude a root filling procedure in one session - if possible. There are some occasions when it proves impossible to remove all the pulp in one session. 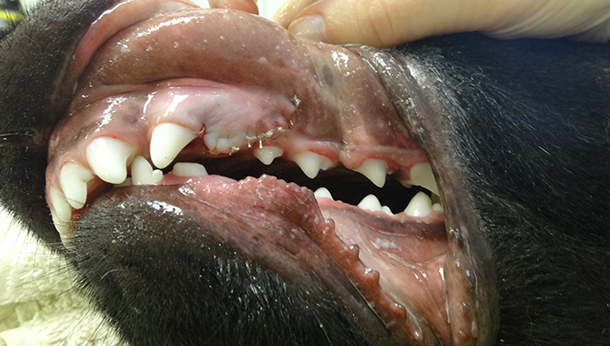 Usually this happens in young dogs less than two years of age with wide pulp chambers that have recently fractured the tooth. The pulp is still very inflamed, vascular and friable. If we can't dry the canal we are unable to place the final fill of rubber and cement. In these cases we flood the canal with a calcium hydroxide dressing and place a temporary filling to close the canal. The calcium hydroxide will dissolve the remaining pulp tags and kill the bacteria. A few weeks later we flush the dressing out and conclude the the root filling as per normal. The PDF file below provides you with a PowerPoint presentation we use in the consulting room as an illustration. Use this link to download the PDF - PowerPoint Root Canal. We are frequently asked whether fractured deciduous teeth should be treated or wait until they fall out. In principle, the advice is the same - despite the fact that the tooth is temporary. If the tooth is fractured and pulp is exposed it will inflame and become infected. Because these young teeth have lots of pulp the signs can be severe. The first case shown below is from a young 8 month German Shepherd pup. The left upper deciduous canine is broken off at the tip exposing the pulp. The pink rubber stick in the left side image is placed into a draining sinus from an abscess formed at the root apex identified on the radiograph by the rubber stick. Careful, surgical extraction of the deciduous canine with good exposure (via a triangular mucogingival flap) will resolve the problem. Care must be taken not to damage the adjacent permanent canine. In the second case, the right upper deciduous canine was broken off at the gum margin and it not visible. The left image shows a swollen buccal bone plate which was very painful to touch. The radiograph below right below shows how much root is actually still present but not grossly visible. The large amount infected pulp makes this tooth a problem that must be resolved. It's best not to wait here. The damaged deciduous teeth in both cases were removed surgically via wide mucogingival flaps which allowed the access required to properly remove all root fragments and also curette/flush the areas before closing with sutures. This pup was given rawhide chews to play with. Clearly objects this hard will easily fracture fragile teeth and should be avoided. The general advice we give regarding deciduous teeth is that they should be properly removed if the pulp is exposed. To ignore them is to store up a potential problem for the successor permanent tooth - and inflamed pulp is always painful.